22 hours 28 min ago. BBC Culture recently asked artists and curators to imagine the changes and trends that will influence art in the next two decades. Read on for their findings: 18 min 31 sec ago. There's a new nonprofit artist-space in Sunset Park, Brooklyn, and it's the largest such space to appear in the city in 20 years. Here, The New York Times speaks with several of the roughly 100 artists who have studios at ArtBuilt Mobile Studios, as well as founders Esther B. Robinson and Guy Buckles: 15 hours 28 min ago. Our "Artists as Innovators" exhibition is now on view at SUNY Plattsburgh through August 9, 2019! Throughout the exhibition, there will be a series of artist talks and workshops with exhibiting and local artists who have received NYSCA/NYFA Artist Fellowships. Don't miss out on tomorrow's artist talk and Friday's fibre sculpture workshop with Elia Alba! Plus, upcoming talks and workshops with Guerrilla Girls and Carrie Hill. Details & RSVP: http://bit.ly/2L0gOrC Image: Elia Alba, "Busts (Caitlin)," 2009, photo transfers on fabric, rope, grommets, acrylic, Courtesy of the Artist 1 day 16 hours ago. Award opportunity alert! NYFA has announced the creation of the Recharge Foundation Fellowship for New Surrealist Art, a $5,000 award for painters living in the United States and U.S. Territories who are working in the New Surrealist Style. The New Surrealist style is an extension of the Surrealist movement, where artists combine relatable imagery in uncanny and unexpected situations within their work. The award program will be administered by NYFA with funding provided by the Gu Family of the Recharge Foundation. More below: http://bit.ly/2PoXcvC Image: Courtesy NYFA 2 days 14 hours ago. In Hyperallergic's review of the exhibition "From Dürer to Digital and 3-D," the writer notes that "part of the exhibition’s lure comes with its dynamic curator, Judith K. Brodsky," NYFA's Board Chair, who elevates an undervalued medium. On view at Trenton City Museum at Ellarslie Mansion until April 28. 3 days 21 min ago. 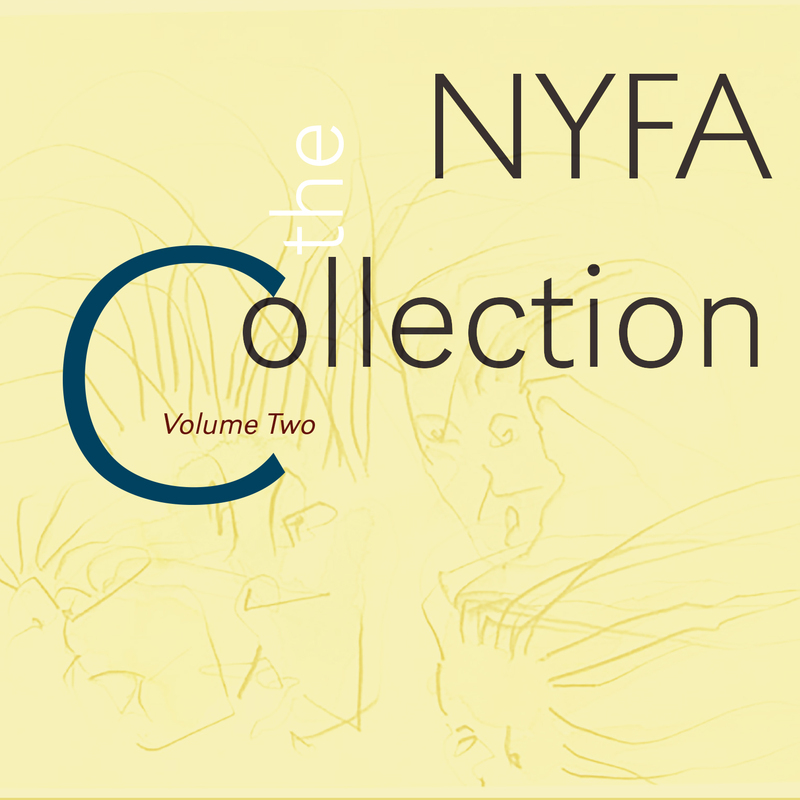 The follow-up to 2010’s critically acclaimed NYFA Collection, The NYFA Collection: Volume Two collects works by the 2013 Music and Sound Fellows and presents a staggeringly broad swath of sonic territory: Fellini-esque circus music, a meditation on the exile of immigration status, guitar stabs and accordion solos, abstract jazz and new music piano, pop references, odes to molars and a bad storm, are just some of the paths explored by this diverse group of artists. Over the last 30 years, the New York Foundation for the Arts (NYFA) has awarded over $27 million in unrestricted cash grants to over 4,400 artists, giving them the time to create, to be inspired and to inspire. The NYFA Collection: Volume Two continues the archiving and dissemination of the New York music collection, which began with The NYFA Collection: 25 Years of New York New Music (innova 233)—a collection DownBeat called a, “stunning document of historic culture.” Volume Two celebrates the 30th anniversary of NYFA’s Artist’s Fellowship Program by releasing ten tracks created/composed by the most recent class of Music and Sound Fellows. The recording has been curated by Cristian Amigo (composer-in-residence, INTAR Theater) and innova’s Philip Blackburn from work submitted by the composers themselves. The through line in a collection as diverse as this is not found in tone or texture, but in its adventurous nature, in the unfettered possibilities of creative minds at work. Dive straight in, and enjoy.